Cleaners at the City of London who work for Ocean Contract Cleaning have faced these problems and more. As IWW members they have raised complaint after complaint about bullying, management nepotism and abuse. Our union has been reasonable, professional and constructive. But again and again Ocean has said they will deal with the problems, again and again they say they are â€˜investigatingâ€™. It seems that Ocean is waiting until a TUPE transfer in September to wash their hands of what they have done. 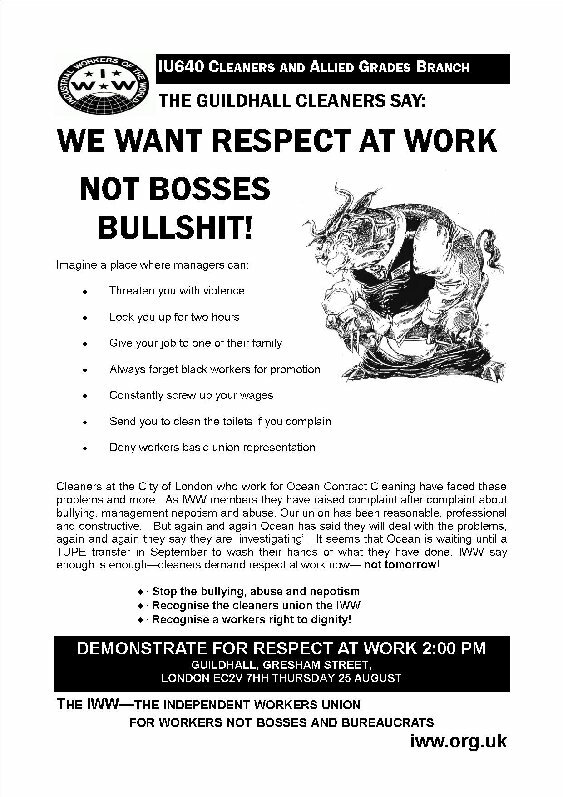 IWW say enough is enoughâ€”cleaners demand respect at work nowâ€” not tomorrow!